It’s no secret that achieving sales and marketing alignment yields numerous benefits. The advantages for the sales team are largely self-evident. Working seamlessly with marketing leads to higher-quality leads, more impactful content, and better overall support. This enables reps to reach prospects the right way and close more deals. What’s in it for the other side? That isn’t as inherently obvious, but be assured, there are many tangible marketing benefits driven by tighter alignment with sales. A unified approach tends to make marketers more efficient, productive, and valued. And this all adds up to perhaps the most favorable outcome of all: an increased marketing budget. 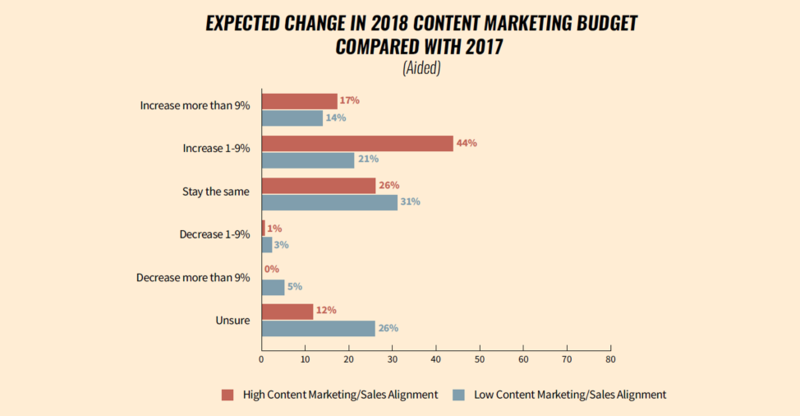 New research conducted by LinkedIn and Content Marketing Institute found that 61% of content marketers that are highly aligned with sales teams expected their budgets to increase in 2018, compared to only 35% of those who lack alignment. Stagnation and uncertainty are far more prevalent among companies lacking alignment. These findings are hardly surprising; it only makes sense that improved collaboration with sales would lead to an increased budget for marketing. There are two primary reasons for this. Studies have found that aligned organizations can achieve 208% higher revenue than those remaining siloed. And it goes without saying that when companies are earning more money, they’re likely to reinvest in the drivers of those gains. The flip side is also true. Misalignment costs B2B companies 10% or more in annual revenue. When income drops, the negative impact is felt throughout a business, and sadly marketing is often one of the first victims when it comes to budget cuts. When marketing and sales are operating in tandem, it leads to faster and more reliable profit growth, which is typically reflected by expansion of resources to augment the positive trend. Not only do aligned companies tend to see higher revenues, but it becomes easier to attribute these increases to marketing activities. Giles House, chief marketing officer for CallidusCloud, spoke to this in his interview for the eBook Driving Intelligent Customer Experiences. That’s just one example, but it’s not uncommon. “Marketing really has not been looked at through a lens of revenue generation, and that’s what’s changing,” according to marketing exec Fergal Glynn, who adds that aligned companies can adopt KPIs such as “deals influenced” and “deals sourced” to better connect bottom-line results with marketing assets. When the two units are on the same page, working around the same strategy and goals, there is greater clarity and agreement around metrics and attribution, removing some of the mystery from marketing’s role in driving new business. The ability to trace revenue directly to the department makes increasing budget an easy call. With this in mind, it should be an equally easy call for marketers everywhere to build bridges with sales and aim for stronger alignment. Such a setup leads to more visibility, more credit, and more budget. To learn more about the tapping into the advantages of sales and marketing alignment, download our full report, Content Marketing: Unlocking Sales and Marketing Performance.